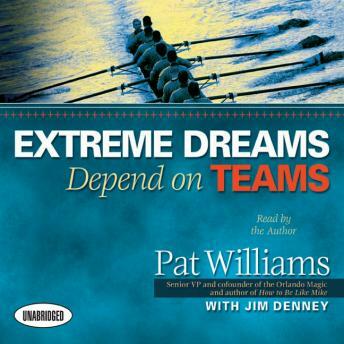 EXTREME DREAMS really do DEPEND ON TEAMS! Their accomplishments are hailed as amazing 'individual' feats: Charles Lindbergh crossing the Atlantic. Thomas Edison creating a thousand patented inventions. Michelangelo painting the Sistine Chapel. Lance Armstrong winning seven straight Tours de France. Though the vision of each of these people changed the world, all of these so-called individual feats were achieved through teamwork. Lindbergh, Edison, Michelangelo, and Armstrong were master team-builders who recruited people with diverse skills, talents, and temperaments. They reached 'impossible' heights through teamwork. Extreme dreams depend on teams - lack of teamwork is often why big dreams go unrealised. Using examples and anecdotes from history and contemporary people, Pat Williams shows how the greatest world-changing events came to be as the result of the passion of one person. In each case a team was assembled with people equipped in the various areas needed to bring the vision to pass. Pat addresses team assembly, dynamics and pitfalls to give listeners guidance they can immediately apply to their own circumstances. If you want to achieve a grand vision. If you want to make 'impossible' dreams comes true. You need the power of teamwork.